In summer 2003 I reviewed on this site a CD-ROM entitled �Between Earth And Sky: The Hour Of Meditation And Prayer�. This was an issue from Cantolopera being Volume VII of their �The Great Interactive Opera Encyclopaedia�. On that disc there were hours of involving content including a spoken and visual analysis of the characteristics of the baritone voice; other volumes in the series covered the other vocal registers. Each disc in the series allowed analysis of ones own singing voice. They gave the opportunity to sing arias with the music coming from speakers or headphones as the words and score passed across the VDU. This new series from Cantolopera are straight CDs, but their sub-title �to be Experienced as a Protagonist� gives the clue to their purpose. Each disc of arias is sung by professional singers, backed by orchestra and chorus. These �model� tracks are then followed by the music and chorus alone, allowing the listener to try his/her talents and skills, with the backing of an orchestra rather than just a piano. The words, in the language of the aria, are given with an English translation. However, as no music script is given, as was the case on the ROMs, a vocal score is a must for the serious protagonist. This is particularly so because the words provided do not indicate reprised phrases. There is also the complication that some arias are given in abbreviated performance versions that may differ from standard vocal scores. However, serious users of these discs, which are in no way �jokey karaoke� should have no difficulty in using them as intended as well as listening to the performances of professional singers. Given also that each disc has �fach� variations (such as lyric and spinto etc arias), they will help the user define their individual vocal strengths for themselves. Each disc is a separate entity and can be purchased in that form. Soprano is the highest category of female voice with a normal range between middle C and two octaves above. Although rarely specified by composers in scores, several very clear sub-divisions exist and are widely recognised in terms of the tessitura certain roles demand. In general a soprano will be able to sing roles within two of the divisions at any one time with perhaps a movement towards the heavier end of the �fach� as the voice develops with age or training. However, an aspiring singer should really come to know, at as early a stage as possible, where the middle of their voice lies at any one time. In this respect these CDs can provide an admirable aid. Failure to recognise where the voice lies can lead to straining the vocal chords to give the voice weight, or lift. Such strain beyond the innate limit of the voice can do irreparable damage. 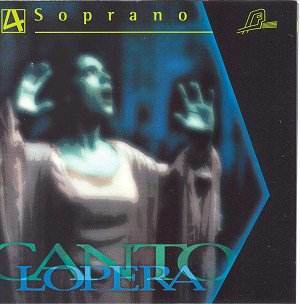 The six CDs devoted to the soprano voice cover 42 arias, mainly in the Italian repertoire. As indicated there are several clear divisions within the soprano voice and vocal range. First, the lightest is termed �soprano leggiero� and encompasses roles such as Norina from �Don Pasquale� (CD 2 tr. 2) and Zerlina from �Don Giovanni� (CD 3 tr. 6). �Coloratura� roles are relevant where the middle of the voice lies towards the top of the range, includes a good trill and has particular flexibility. These roles include the likes of Gilda in �Rigoletto� (CD 2 tr. 5) and the eponymous Lucia (CD 2 tr. 1) where many singers will interpolate high E flats in the �Mad Scene�. Mozart wrote several high Fs for Constanze in �Die Entführung�, whilst the Queen of the Night in his �Magic Flute� has to scale the heights with pinpoint accuracy (CD 4 tr. 3). Not requiring that stratospheric facility, but needing more colour and dramatic impetus during the opera, are roles such as Amina in �La Sonnambula� (CD 2 tr 2) and Violetta in �La Traviata� (CD 5 trs. 4 and 6). The latter role really could be said to require two distinct voices for the part, and it is not without significance that two singers are used here for the two arias. The first (tr.4) requires vocal coloratura display, whilst the second �addio del passato� calls for greater capacity for colour and weight in the voice. Such qualities are more likely to be found in the �lyric� or even �lirico spinto� voice. Here, except for the second Traviata aria, Linda Campanella who, at the time of the recordings, was specialising in the coloratura repertoire sings these roles. She is heard on ten tracks in this series and whilst lacking a wide range of colour and a good trill she hits the notes clearly. The �lyric� soprano voice might be considered the middle soprano and such voices are suitable for roles such as the Countess in �The Marriage of Figaro� (CD 2 tr. 3) and Mimi in �La Bohème� (CD 3 tr. 1) which require weight and colour and also the lighter Susanna (CD 7 tr. 7). The lyric soprano �fach� is well represented in French opera by such roles as Micaela in �Carmen� (CD 2 tr. 5) and Marguerite in �Faust�. As we move to consider the �lyrico spinto� and full �spinto� or dramatic roles, the distinctions can become blurred. In general the �lyrico spinto� voice will be fuller, capable of more colour, and above all else have more heft, or strength, than the �lyric� soprano so as to be able to soar over the orchestra. The many examples on these CDs from the operas of Verdi cover the �lyrico spinto� fach. The part of Aida (CD 2 tr. 6) verges, like Leonora in �La Forza del Destino� (CD 6 tr. 4), Tosca (CD 6 tr. 1) and Butterfly (Cd 1 tr. 5) on the sort of full spinto that is needed for the role of Turandot (CD 6 tr. 3). It also overlaps the German �Hochdramatisch� �fach� encompassing Richard Strauss�s �Salome� and �Elektra� and also much of Wagner�s writing for soprano. Much of the Italian �spinto� repertoire on these discs is sung by Antonia Cifrone, who is heard on twelve tracks including the heaviest roles of Aida and Turandot. A finalist in several international competitions she has sung in many provincial Italian theatres as well as outside that country. She is an accomplished singer with fair vocal skills but, like several of the other young singers illustrating these arias, she is unlikely to make the top international flight. None the less those aspiring to sing this repertoire can get a feel for both the music and the minimum standards required in the professional sphere. These discs also provide diverse examples from the Italian operatic repertoire. Listen to CD4 tr. 3, �The Queen of the Nights� aria for an example of high coloratura, to CD 4 tr. 1 for the lyric Mimi and CD 2 tr. 6 for the heavier demands of Aida.